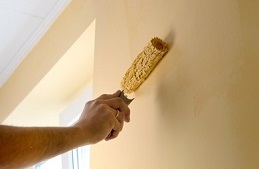 The best Morristown home painters are at your service. The Painting Company has painted hundreds of homes in its day, but the one we're most excited about painting is the one we're painting today. Your home could be that home. A home is a place of comfort and warm memories and, for most of us, our largest asset. It is an investment worth protecting and beautifying. For homes on the market for sale, real estate agents encourage homeowners to start with a freshly painted house. Before exterior work begins, shrubbery, walks, railing and decks are covered with drop cloths, tape and plastic. 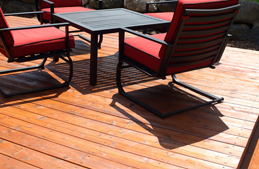 Power washing is done to remove any dirt and mildew. This is followed by fastidious scraping, sanding and priming. Beside our standard painting services we also offer Dry Erase Painting. Writing on the walls used to get you in trouble, now it's encouraged! 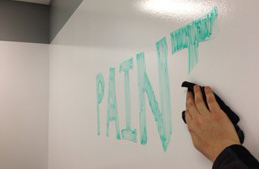 Transforms any wall into a writable surface and can be applied to virtually anything you can paint. 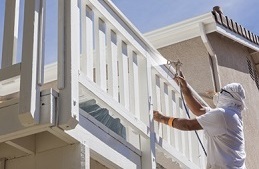 The Painting Company knows what is expected with a painting or staining job. We pride ourselves on performing your job on time, done right. That's our mission. So when you bring The Painting Company in for a painting or staining job, we bring the level of detail and professionalism that you expect. 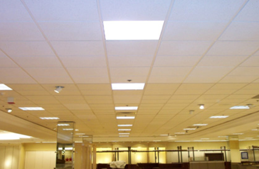 We can resurface an entire existing tile ceiling system in place with an acoustical coating, which is similar to, but higher in quality than the finish manufacturers apply to new tiles; providing a like-new appearance and better than new function. 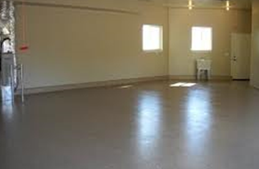 Epoxy Concrete Floor Coating can be applied to basement floors, or any interior concrete floor. It can be used in some full outdoor applications, but the sun's UV rays may diminish the gloss finish, as well as fade the color over time. The Painting Company was very prompt in returning my initial inquiry. They gave me the best price with a formal written estimate that day. They were able to schedule the painting ASAP and on my time. They showed up right on time each day and completed the job with professionalism and within the timeframe they laid out. We would definitely use them again and recommend them. I stopped by today after work and everything looks just beautiful. I love it. The master bath is perfect now and all the closets and doors look so good. I can't wait to move my stuff in! I’ll be at work tomorrow afternoon starting at about 3:30pm until at least 7pm so I can give you the check for balance then if you can come by. See you then. "Wonderful job on our house!" I am sure glad I had Tony DeCaro paint my home! Hope to have him back after a very big garage sale! Our home looks bitchin! Thanks Tony! Thank you so much for your work panting the interior of our home. We are so happy. The house is beautiful. It was a big job and your team were in every way professional and helpful and did a great job. The accurate initial cost estimates, adherence to promised time frames, and excellent quality of the work made this is a really great experience. Please feel free to tell other potential clients to contact us for a glowing referral. If we have any painting jobs in the future, you will definitely be hiring from us. Right from the first phone call to request an estimate until the job was completed the service and professionalism of Tony and his crew was impressive. He was quick with an estimate and finished the job well and on time. His crew is very friendly, skilled and professional and they do a great job cleaning up each day as well. Overall my experience was excellent and I would recommend Tony and crew to anyone!